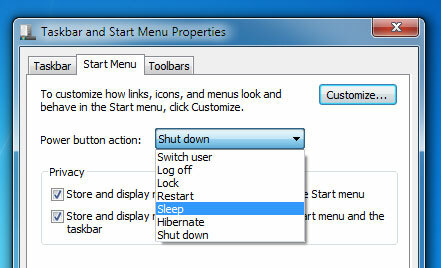 I’ve set my laptop to sleep after half an hour but sometimes I need to leave immediately and I want to sleep it right away, however for the nth time I’ve accidentally shutdown my computer instead of putting it to sleep. Solution (which I’ve been putting off for a long time)? Change the default action on the start menu lower right button to sleep! 1. Hover your cursor to the Start button and right click. 2. Click on Properties and you should see a tabbed window like this. 3. On the right side of the Power button action, you should see a drop down. The action you select will define what shortcut will show on the start menu. In my case I want to set it to sleep. 4. When you’ve made a selection, click on Apply and OK.
5. Done! 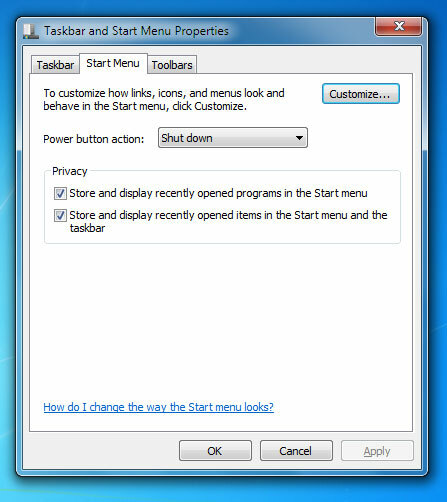 Now when I click on the Start button, I’m a 100% sure I won’t accidentally shutdown my computer.